These were the words of encouragement from the Secretary of the Department for Community Development and Religion, Ms Anna Solomon to the participants of the Papua New Guinea Practice Parliament for Women. The practice parliament started yesterday at the Gateway Hotel in Port Moresby with training for the women participants focused on various agendas, which will end on Saturday 11th March. 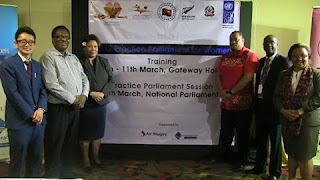 The actual practice parliament sessions will be conducted on Monday 13th March at the State Function Room. This weeklong training will be focused on key objectives such as; Participants to understand key parliamentary procedures; Building Understanding of key parliamentary procedures; Develop Policy/analytic skills; Develop Participants understanding of running in elections and Participants understanding of working with the media during elections. “You have to feel very privileged to be here, because it was a tough selection. Out of 200 applicants only 50 were selected,” said Secretary Solomon as she acknowledged and welcomed the participants. The Secretary also commended the organisers, particularly UNDP and other partners for the development of the program, and said it was very fitting for this training because these are areas were not only women but male politicians are still unaware of. “So if you want to get into parliament, I suggest you start learning now. Don’t leave it till it’s too late. Don’t wait till you get into parliament. And this is a very fitting time with the program excellently shape in a way that will help build your capacity". Ms Solomon said she will be looking forward to see the results and the outcomes highlighted in this meeting.